We’ve taken political correctness to ridiculous extremes in this country, and I’ve ranted about it before. These days you can scarcely say or do anything without offending someone. It just depends on who observes your actions and whether they opt to play the PC card (and these days we have far too much playing of cards). “Sheriff Joe is the kind of guy that you gotta love, as long as you have papers,” Kavanagh quips in the recording. CNN leaped into action and sent a female Hispanic reporter (to ensure a biased report?) to cover the outrage. Kavanagh declined to be interviewed but Arpaio, never one to shy from the cameras, agreed to talk to her. She asked if he was offended by Kavanagh’s remarks. No. Why not? Kavanagh’s a friend and it was a roast. Well, I’m Hispanic and I’m offended. Goodie for you, lady. You were not an invited guest. Neither, I suspect, was the SPLC member who recorded the evening’s remarks. Seriously, did she not understand what a roast is? It certainly didn’t sound like it. Roasts, which I don’t care for at all, are intended to roast the guest of honor. Friends tell jokes at the expense of the honoree. During the few roasts I’ve been unfortunate enough to come across on TV, the jokes usually consisted of insults, cheap shots, crude language, bathroom humor, etc. It seems safe to assume that if you are roasting a man like Joe Arpaio, and the guests are all friends of Arpaio who probably have much in common with him, many of the jokes and insults about him are going to center on his well-known treatment of illegal immigrants in Maricopa County. It was a roast. Roasts are, almost by definition, politically incorrect. And it was closed to the press. Don’t go to (or sneak a recording of) an event like that sponsored by a group like the Western Conservative Conference for a man like Arpaio and then complain about being offended by what you hear. People have gotten so stupid. So many looking to start a fight (and then run off and whine about it)The media feed the mania. Thank you. Yes, there’s enough bad news to report without trying to gin up artificial outrage. Trump is offensive; he deserves to be offended. But yes, the press corps dinner was nicely done, although (a) I don’t recall it being billed as a roast per se (could be wrong about that) and (b) everyone knew it was being nationally televised. Most folks mind their PCs and Qs when the nation is watching. 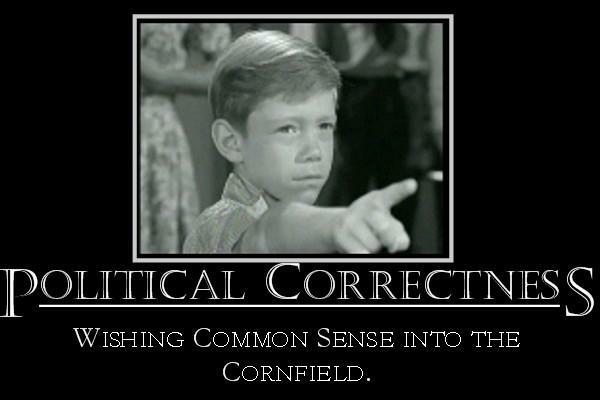 Political correctness – I’m offended by that! Wait… I’m offended by everything. Given the state of the world today, that’s perfectly understandable. Any CNN story needs to begin: Dateline: Dumb Down …but in fact I find it hard to watch any of the three cable news outlets, and the nets are just rip and reading and touting which video just went viral three days after the fact. This story seems a silly sidebar to revisit, for a few more cycles, Brewer’s veto. I think the media bear much if not most of the blame for the dumbing down of America. Sad, when they are in a position to do just the opposite. People putting forks in sockets and then being surprised when they’re shocked. Nah, they do that because they want to be shocked. Then they can play victim and scream for retribution against the impertinent sockets that dared to shock them.